Large-scale heating systems, which include floor and ceiling heating, represent such an example. 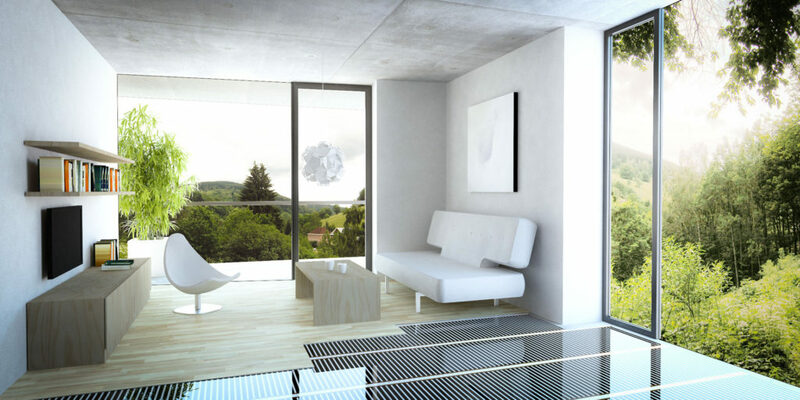 Since floor heating in particular is very popular in residential buildings these days, let us discuss the systems in more detail. The idea to heat up the floor and use it to heat up the whole room was one of the consequences of the development in technology; however, it was gradually confronted with the increasing user demands. 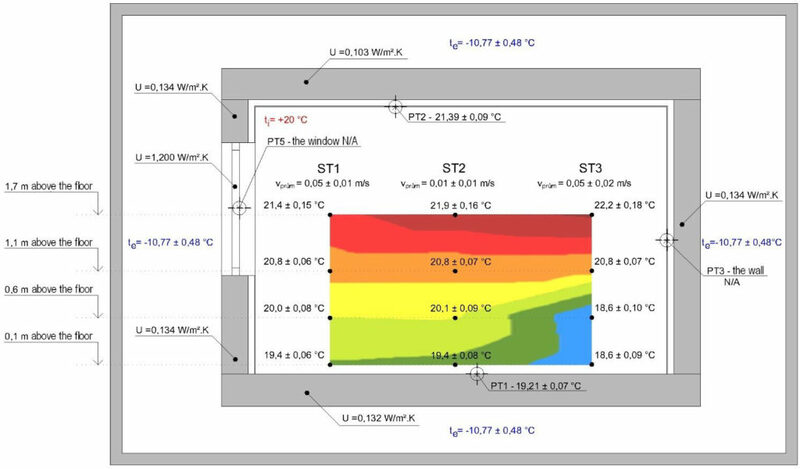 First of all, there was the issue of increasing the inside temperature that was not in line with the technical properties of the buildings – with the growing demand for heat, the surface floor temperature had to increase to 30-35 °C for the heating system to provide the required performance. However, later research concluded this temperature is too high, causing adverse health risks long-term. Thus the maximum floor temperature for rooms heated up by floor heating with long-term occupancy was limited by regulations to 27 °C (the so-called hygienic temperature maximum). Regulation was another problem – great inertia and bad controllability were characteristic for the massive concrete floors with the floor heating piping. It seemed that the first problem – i.e. 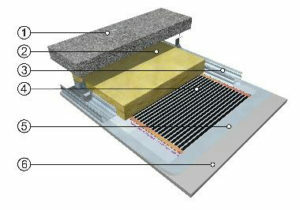 excessive floor temperature – would be solved by moving the heating piping to the ceiling structure. 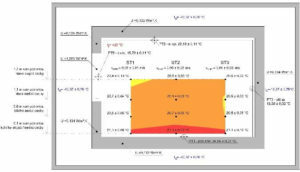 Higher ceiling temperature did not cause any trouble and therefore ceiling heating could provide the required output. If the ceiling/floor was between two floors, there was thermal insulation above the ceiling heating piping in the structure, which limited heat transfer to the floor above. However, because the structure was still rather robust, the issue of bad controllability and inertia remained. These maladies resulted in decline in the use of large-scale system and the preference of wall-mounted heating units – radiators. negative effects of energy production and consumption on the environment caused the output needed for heating up new buildings keeps decreasing. Low-temperature systems came into play – the heating source (radiator) temperature required to heat up a room became much lower and it was possible to take floor heating into consideration again. In today’s new residential buildings, not only is the hygienic temperature maximum of 27 °C not exceeded, but when the outside temperature is around -15 °C, with a correctly designed heating system, the floor temperature is only around 23–25 °C. The second handicap, i.e. large inertia of the large-scale systems, was significantly affected by new technologies. 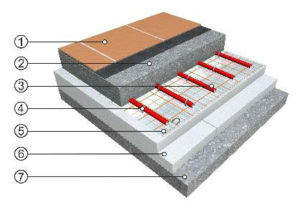 Electric heating cables, 3–4 mm in diameter, or electric heating foils, about 0.4 mm thick that can be installed directly under the floating floors started being used for floor heating. This way the robust structures could be abandoned and replaced by thin-layer floors, or floors made using the dry construction system. 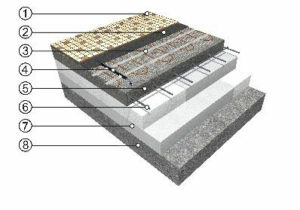 Base – concrete, anhydrite, original floor, etc. This brings us to the question why prefer floor heating to the conventional convective systems in the first place. There are several reasons. 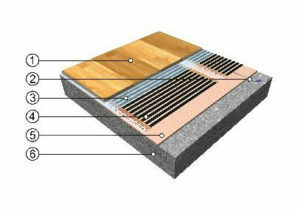 If we ignore the practical side, meaning that the heating is not visible and is not in the way, as well as the positive effect on comfort (the floor is not cold), the large-scale systems demonstrate considerably more even temperature distribution in the room, which also has a positive impact on operating costs. This is not a surprising finding, as proven by the ever increasing number of users who choose floor heating for their houses and flats. The floor heating graph shows even temperature distribution – the difference between 0.1 m above the floor (ankles of a person standing up/sitting down) and the height of 1.7 m (head of a person standing up) is 0.8 °C. The whole temperature field is very homogenous, the differences in the whole measured area are in the range of tenths of degrees. Even at the «outside» temperature of -10.4 °C (area around the climatic chamber) the required temperature of 20 °C was achieved and maintained with the floor temperature of only 25 °C. The convection heating, as shown in the second graph, demonstrates considerably higher differences – the difference between temperatures at the height of 0.1 and 1.7 m is 2.5 °C, which in reality is felt as substantial discomfort. Ceiling heating mentioned above is the other large-scale system option. It was mostly the introduction of electric heating foils that make the construction of ceiling heating much easier, which made this system an option equivalent to floor heating. Still, the number of floor heating installations is several times higher than the number of ceiling heating installations. This is due to the fact that in our territory, the system has not been used traditionally, most people see it as somewhat unnatural and do not trust it. can feel the warmth radiating from the source. The higher the surface temperature, the greater and more noticeable radiation. This radiation (thermal or infrared radiation) does not heat up the air but solid objects it falls on. 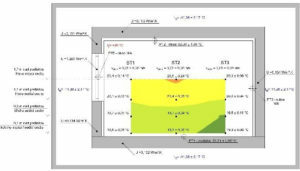 The radiation is the most intensive perpendicularly to the source plane – in the case of ceiling heating, the radiation is thus directed mostly to the floor, furniture and partially on walls. These surfaces also heat up air in the room. Except for the 20cm layer under the ceiling mentioned above, the air temperature is the same across the room height with ceiling heating as well. 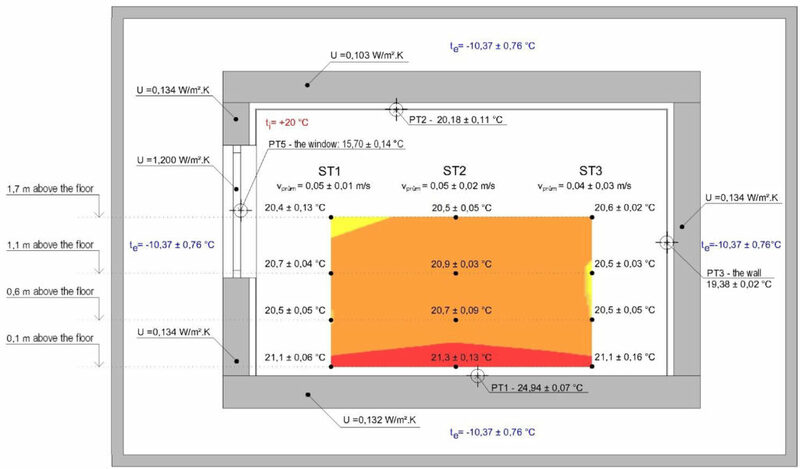 To verify the properties of floor, ceiling and conventional convective heating by exact measurement, benchmark tests were performed at the University Centre for Energy Efficient Building (UCEEB) of CTU in Prague. The measurements took place in a climatic chamber at the UCEEB in Buštěhrad, using the heating systems of FENIX Jeseník, the largest Czech electric radiation heating system manufacturer. Electric convector heating was chosen for the measurement for two reasons. Firstly, because of the fact that this is one of the most dynamically developing systems – the annual ratio of this type of heating in new buildings increased from 8% in 2000 to approximately 30% in 2016. The second reason was purely practical – installation, control and exchange of the respective systems during the tests and use in the climatic chamber were objectively the easiest. The results were recorded at the moment of achieving a steady state. The performed tests confirmed both systems are very similar in practice. The ceiling heating temperature field graph shows that, same as with the floor heating, temperature distribution is completely even; the difference between the temperature at the ankle and head level of a person standing up is only 0.7 °C. The room temperature is at the required 20 °C, even more precisely than with the floor heating. The space around the climatic chamber was somewhat colder (-11.4 °C), the ceiling temperature of approximately 33 °C was sufficient to maintain constant temperature. The graph also shows that the floor temperature was 0.6 °C higher than 10 cm above the floor – which practically demonstrates how radiation from the ceiling hits the floor and heats it up. This brings us back to the question asked at the very beginning – it is relatively clear that large-scale heating is one of the most convenient heating methods. However, which is better – floor or ceiling heating? The measurements show that the systems are equal. From a practical point of view, a slightly higher floor temperature, potentially creating the feeling of higher comfort, is a positive aspect of the floor heating. On the other hand, there are restrictions concerning flooring and the necessity to decide on furniture and equipment placement in advance in order to prevent unwanted floor coverage. 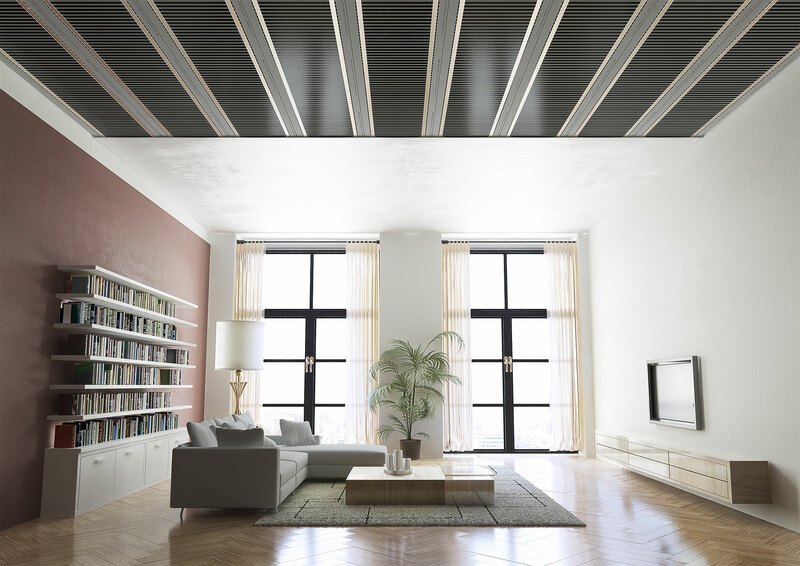 With ceiling heating, the user is completely free in terms of furniture placement, plus there is the appreciable advantage of faster control response. Today’s new buildings are very sensitive to heat gain, both from insolation and from additional sources, and if the heating system does not respond quickly enough, the rooms are overheated. In this respect, ceiling heating is demonstrably more flexible compared to floor heating. On the other hand, the necessity to combine the ceiling heating with plasterboard suspended ceilings that may not be integrated in the building, is a disadvantage. While floor heating is considered standard these days, ceiling heating is unjustly neglected and it definitely deserves more attention than it has been paid so far. For instance, it may be the ideal solution for wood-frame buildings that use plasterboard suspended ceilings, providing full user comfort and freedom concerning furniture placement and floor type.